Dr. Trisha Beal named 2011 Eyecare Professional of the Year! Home » News » Dr. Trisha Beal named 2011 Eyecare Professional of the Year! ORLANDO, Fla., Feb. 2, 2012 – Transitions Optical, Inc. has honored Trisha Beal, O.D. 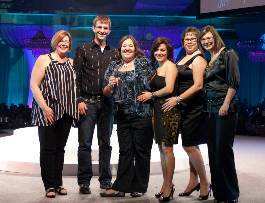 – of Brant Family Eye Care in Ontario – as the 2011 “Eyecare Professional of the Year” through the Transitions Healthy Sight Awards program. Dr. Beal was recognized during the 16th annual Transitions Academy at Rosen Shingle Creek in Orlando, Fla., for her overall support of the Transitions brand and her efforts to actively promote eye health within her practice and local community. While Dr. Beal has always incorporated the Transitions family of products into her practice philosophy, in 2011, she made it a priority to help staff members make Transitions® lenses a natural part of their everyday conversations. Dr. Beal kicked the year off by working closely with her Transitions representative to plan a workshop that focused on role playing. As a result, the tagline “Clear Lenses That Do More” was identified as the best way to talk about Transitions lenses as an ideal, everyday pair with patients. The tagline – and additional internal staff education – helped Dr. Beal build momentum and achieve a significant increase in sales of Transitions lenses in 2011. This summer, Dr. Beal’s practice even added Transitions lenses to its stock lab inventory, which allowed them to offer an in-house promotion that gave patients the option to receive their lenses right away. Throughout the year, Dr. Beal made kids eye health a priority by offering Transitions-specific promotions and focusing the majority of her community outreach efforts on raising awareness among kids and their families. During the first half of the year, kids could upgrade their lenses to Transitions lenses for only $16; and, during the second half of the year, kids could upgrade to Transitions lenses, free-of-charge. Dr. Beal also offered RecSpecs with Transitions lenses, which she believes is a perfect combination for kids who play outdoor sports and something that sets her practice apart. The 2011 back-to-school season was a busy time for Dr. Beal, as she and her staff put together welcome kits for classrooms at a local school. The kits included educational materials like the new Kids Eyes brochure from Transitions Optical, Transitions Championship® photochromic pencils and a pair of sunglasses to emphasize the UV protection message. To support Dr. Beal in continuing her healthy sight efforts in 2012, Transitions Optical will provide her with a $1,000 grant through the Transitions Healthy Sight for Life Fund™. She will also receive additional rewards such as a celebratory dinner for her staff; a trip for two to attend the 2012 Transitions Championship®, a PGA TOUR® event; an “ECP of the Year” certification and wing cling for office display; and cash prizes for each staff member. Other finalists for the 2011 “Eyecare Professional of the Year” title included Alain Côté, O.D., Clinique optométrique de Lennoxville, Quebec and Diana Monea, O.D., The Eye Health Centres office – Kensington, West Region. Both were also recognized during Transitions Academy. Now in its fourth year, the Transitions Healthy Sight Awards program recognizes and rewards independent eyecare professionals who demonstrate excellence in supporting Transitions Optical’s family of products and programs, and who actively promote healthy sight within their practices and the community. To be eligible for the Transitions Eyecare Professional of the Year award, eyecare professionals must be part of an independent practice with no more than 10 locations and have at least a 15 percent share of Transitions lenses. All nominees are evaluated on their sales growth; marketing initiatives and promotion participation; community involvement; and employee education and training.